The bottlenose dolphin is the most studied and best known of all cetaceans. This is primarily due to its ready adaptability to captive environment, such as reserach facilities and marine parks, and its appearance on the TV show Flipper. 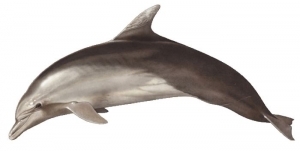 This dolphin has an extensive range and this is the most encountered dolphin species in coastal U.S. waters. The bottlenose dolphin has a long and robust body shape, with a pronounced, stubby beak (hence the name ‘bottlenose’), and a distinct melon. Because 5 of the seven neck vertebrae are not fused together as in other dolphin species, the neck of these dolphins is more flexible. They have about 40-48 sharp conically-shaped teeth in both the upper and lower jaw. The color of bottlenose dolphins may range from light to dark lead gray, with lighter shading on the sides, and a white, sometimes pink to pinkish-gray belly. The dorsal fin is triangular, curved and moderate in size, up to 35 cm in height, and located near the middle of the back. The flukes are proportional, curved, with a deep median notch, and are 65-80 cm from tip to tip. Their flippers are pointed and of moderate length. Adult bottlenose dolphins can reach 4 meters (12 feet) in length, and, in some geographical areas, weigh as much as 650 kg (1,430 pounds). However, in most part of the world their weight seems to be limited to about 350 kg (770 pounds). Males are typically larger than females. These dolphins can be found foraging in deep and very shallow waters. They may hunt and feed individually or in a concerted effort of a group, chasing fish against the water surface, onto mud banks, and shorelines. Association with human fisheries is also reported. They consume about 8-15kg (15-30 pounds) of food each day. Their diet includes a variety of fish species, but also squid and crustaceans. Male bottlenose dolphins reach sexual maturity at age 10, females between 5 and 10 years of age. The gestation period (pregnancy) is 12 months and calves are born in all seasons although in some geographical areas seasonal peaks during spring and fall have been reported. Females give birth once every 3-4 years. At birth, calves acre about 100 cm (3 feet) in length, and may weigh around 10 kg (22 pounds). Calves depend on their mother’s milk for 12-18 months but stay with their mother for up to 5 years learning how to catch fish and the social skills to become a full member of dolphin society. With the exception of polar waters, bottlenose dolphins are found in every ocean around the world, in coastal waters and the open sea. They are frequently encountered in estuaries, lagoons, bays and harbors. There appears to be a coastal and offshore ecotype. Population density appears to be higher in near-shore areas. Bottlenose dolphins are known to have limited home ranges, or may be migratory. Like all mammals, dolphins are warm blooded, breathe air, give birth to live babies, feed their new born milk, and are born with hair. Being warm, blooded, or homeothermic, dolphins maintain a constant body temperature regardless of the surrounding water temperature. Unlike terrestrial mammals, including humans, dolphins are conscious breathers, meaning they must be aware of their breathing to avoid involuntarily taking a breath while underwater. Bottlenose dolphins can dive for as long as 20 minutes but typically hold their breath for only 30 seconds to 3 or 4 minutes between breaths. Bottlenose dolphins may live for 50 years or more, with females generally living longer than males. They live in social communities, sometimes called pods. Group size in near-shore populations is typically 30 or less while offshore groups may comprise several hundred individuals. Even though they appear to live in relatively open societies, they exhibit strong social bonds that help provide protection against predators, assist in locating and catching food, and aid in the rearing of their offspring. Like in other social animals, play is an important part of learning. Behaviors such as fish toss, bow riding and seaweed-keep-away are considered play but also help dolphins develop social bonds as well as useful hunting techniques. They use multiple feeding strategies, including “fish whacking,” where they strike a fish with their flukes and knock it out of the water, and driving schools of fish into shallow areas or onto mudflats. Bottlenose dolphins use high frequency echolocation to locate and capture prey, and high-pitched ‘whistles’ to communicate with one another. Bottlenose dolphins are protected in U.S. waters by the Marine Mammal Protection Act. While the species is not considered endangered, they are near depletion in some areas and threatened in many others. Incidental and direct exploitation are generally reported at moderate to low levels. According to NOAA, current threats come primarily from incidental injury and mortality from fishing gear (such as gill net, seine, trawl, and long-line commercial and recreational operations), exposure to pollutants and biotoxins, viral outbreaks and direct harvest in some countries (e.g. Japan and Taiwan). Studies of large, high mortality events over the last decades suggest that the immune system of these animals can be severely affected by heavy metals, PCBs and other pollutants. In an effort to reduce injury and mortality of coastal bottlenose dolphins along the eastern seashore of the U.S., the National Marine Fisheries Service implemented the Bottlenose Dolphin Take Reduction Plan (BDTRP). This initiative includes provisions for research and education, and requires modifications of fishing practices for small, medium, and large-mesh gill-net fisheries from New York to Florida.